The Elmwood Brewing Company currently brews a hoppy Pale Ale, a Nut Brown Ale, a Dry Stout, seasonal brews such as Pumpkin and Apricot Ales, Strawberry Blonde, Hefeweizen, and a California Common. In addition to these is their flagship Amber Ale. 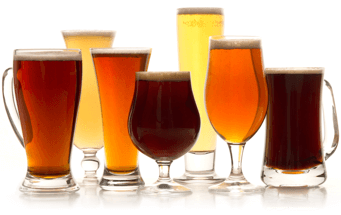 Amber/Red Ales are an emerging style with many varied definitions. Some connoisseurs expect high hop bitterness, flavor and aroma, while others believe that Ambers should be defined more by malt than hops. 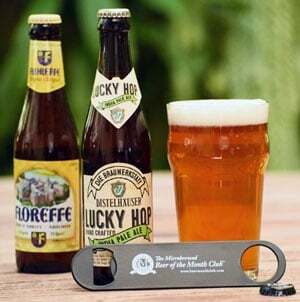 We loved EBC's rendition and feel that, among the hoppier style Ambers, its about the best we've ever had. This dark amber-colored brew features a fairly spicy hop scent which distinguishes itself from a strong background of malty aromas that are dominated by caramel scents. There's a toffee-ish note as well, along with slight undercurrents of pear, and slightly candied essence, giving it faint impression of candied apple/pears. Flavor-wise, peppery hops are prominent in this exceptionally smooth, medium-bodied ale. Look also for a floral hop character to intermingle with the spiced hop presence, balanced by sweet malty flavors. Expect a slightly bitter finish, with a final nutty note. Great with chicken wings, a hearty stew, or a grilled chicken salad with ample amounts of fresh carrots and pecans.